Easel ring binders double as a wonderful, compact presentation product and make an impressive and powerful table or desk top display. Available in Platform Easel or Split/Snap Back Easel Styles. Easel binders make for an effective presentation tool whether for a product display or as a cookbook in the kitchen to view recipes. We can customize your presentation requirement with a great visual aid, an easel binder. Available in all sizes, colors and materials. Snap back easel binders are the best option when you are looking for a binder that can meet custom and versatile requirements for easy display presentations. Easel ring binders double as a wonderful, compact presentation product and make an impressive and powerful table or desk top display. At Ad Industries, we specialize in designing and manufacturing snap back easel binders that allow the users freedom when viewing multiple printed materials. The binders also prevent any loss in terms of compactness and portability. 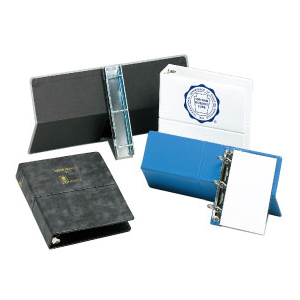 These binders are recognized by the horizontal flexible hinge that allows the binder to fold back. The ring metal creates a stand the props the binder up for easy page turning and viewing. The strap attached to the ring metal has a flap that protects the table top while it is being used for display presentation. The flaps of the binder can also be adjusted to provide maximum support. This allows the user to display contents in a stand-alone format, providing him the freedom to browse the displayed content hands free. At Ad Industries, we provide easel binders platform easel, or split/snap back easel styles. Our easel binders can be used as a great visual aid to meet your presentation requirements. Our binders are available in all sizes, colors and materials. Snap back easel binders provide solutions in terms of versatility and ease-of-use.